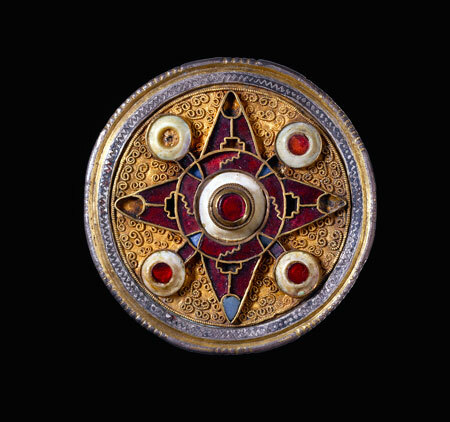 Medieval Power: Symbols and Splendour is the latest offering in the extensive repertoire of touring exhibitions curated by the British Museum. In a ‘great coup’ for the state, the Queensland Museum has scored the worldwide premier for their summer blockbuster season. Medieval Power, which spans AD 400–1500, maps the changing landscape and power struggles of medieval Europe. Traversing an ambitious 1100 years of history in a few text panels cannot have been an easy task for the curators. The focus of this exhibition, however, is not the history of medieval Europe, rather, this is a celebration of the awe-inspiring skill of medieval craftspeople. The medieval collection of the British Museum is one of the most visited in the world, and the objects in Medieval Power: Symbols and Splendour reflect the extent, quality and variety of the British Museum’s holdings. The objects have diverse origins, ranging from a humble pair of shoes, to delicate jewellery, precious religious icons and remnants of great houses in the form of stone carvings and stained glass windows. The range of objects does speak to a lack of curatorial direction and may be confusing for a visitor who is coming for a more traditional A–Z history lesson. If the focus of the exhibition is intended to be on the importance of religious and romantic symbolism, however, then the objects certainly convey how this belief pervaded medieval culture. The objects are predominantly from England, with a strong focus on the 14th and 15th centuries. Nestled in low lighting against cushioned backgrounds, they are beautiful; it is a crowd-pleasing selection. Difficulty seeing objects and reading text labels are common complaints of museum visitors, and I have no doubt that the Queensland Museum has been fielding its fair share of grumbles with this exhibition. These objects are small or need intense lighting to be viewed to full effect. It is not easy to fully appreciate the detail and craftsmanship of signet rings, seals, coins and stained glass windows when they are displayed in low light. The effective use of multimedia screens circumvents the viewers’ difficulty to a large extent, with a function allowing visitors to zoom in on images of the objects. Others, such as the much-loved Lewis chess king, are supported by photographic enlargments. Unfortunately, however, not all the objects receive this treatment and many of them are lost in their showcases, fighting for attention in the dim light. 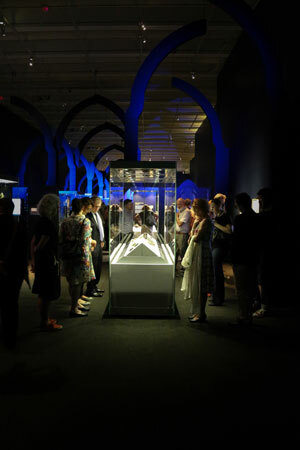 The exhibition is large, beginning with a series of smaller rooms that wind the visitor through a rough timeline of medieval Europe; the rise and fall of royal lines and the expansion and collapse of empires. The text is informative but simple. If you are a medieval enthusiast then you might find yourself skipping over the text and moving straight on to the objects themselves. They are the stars of the show. So much of the majesty of medieval objects comes from the spectacle of their surrounds – the vaulted ceilings and towering stained glass windows of Gothic cathedrals, the winding tower stairs and imposing stone edifices of the centres of civic power. As I walked through the exhibition, I found myself wondering if these objects lost some of their power when removed from their original contexts? The smart exhibition design employed by the Queensland Museum successfully addresses this problem by recreating some of the majesty of medieval architecture. As you enter the exhibition, room dividers have been cut to mimic the intricate designs of stained glass windows. Medieval music is piped quietly in the background to get visitors into an ecclesiastical frame of mind. The main gallery is suitably impressive. Ceiling-high archways echo the nave of a Gothic cathedral. A blue light shines from the end of the room. The overall effect is reverential. 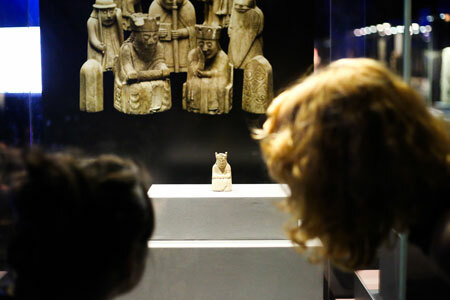 In the showcases, the medieval treasures glimmer. Medieval Power is supported by a series of free talks and a ‘Medieval Power after dark’ program to capture the elusive 18–35 demographic. ‘After dark’ events are becoming increasingly popular in cultural institutions and the Queensland Museum has got the recipe right. DJs in the galleries, live demonstrations (such as silver-smithing) inspired by objects in the exhibition, medieval themed food and, of course, a screening of Monty Python and the Holy Grail. A range of children’s activities have also been developed to encourage families to visit and explore the exhibition. 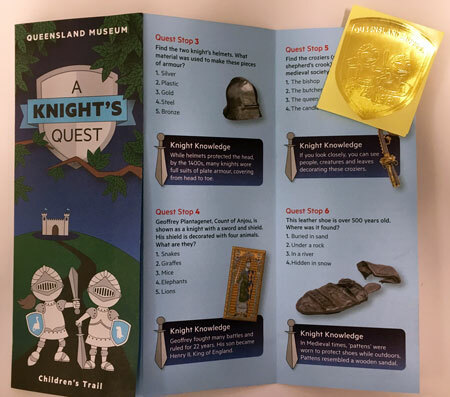 Kids are invited on ‘A knight’s quest’, or can make a paper crown to take home. It is pleasing to see children’s activities that have been developed for a temporary exhibition, as the age of budget cuts means they are often overlooked in temporary exhibition planning. Unfortunately, there is no catalogue to accompany the exhibition and little website content aside from a standard marketing page. It’s a shame, because the collection would make an excellent publication and high-resolution images online would allow audiences to get a closer look at the exceptional craftsmanship of the objects. Like most blockbuster exhibitions, Medieval Power is ticketed and rather expensive; $59 for a family makes for a pricey day out. On the Monday morning that I visited, which is so often a quiet time in museums, the price did not, however, seem to be a deterrent and the exhibition was filled with families and school groups. As a summer blockbuster, Medieval Power has broad appeal. Visitors will leave confident that they have experienced an exceptional slice of medieval splendour. While the vast scope of the exhibition results in a simplification of the period and its complex history, this should not detract from the opportunity to see some of the British Museum’s unsurpassed medieval collection. Hilde Hooper studied medieval history at the University of Queensland and museology at the Australian National University. Some of her earliest memories are of time spent at the Queensland Museum.